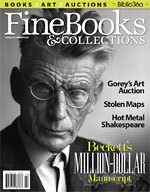 Buy this issue at the Fine Books store. A baker’s dozen of books and manuscripts reached seven figures at auction over the past year. An esteemed rare map dealer pocketed at least a hundred maps from university libraries between 2002 and 2005, when he was finally caught. Your guide to the world of book and fine art collecting, including details on hundreds of events and exhibits to attend, more than 75 clubs or membership libraries to join, and 50 book fairs to browse, plus classes, lectures, and more!